The residence is quite big (and I didn’t really need to sell/give away all that furniture!). There are 4 bedrooms, a lounge, kitchen, dining room, bathroom and laundry…. plus a big sun room, which the Bear has decided will be his play room. When you come in through the front door, the lounge is in an L shape and as you can see, we’ve set it up so that only 2 people can be seated to watch TV, which might be a problem when guests stay. I guess it will come down to survival of the fastest – to get to the recliners. To reach the front door you actually go through a gate and down a path and then through the sun room so it’s actually more like the back door. There’s an after hours police buzzer to ring at the front gate but it doesn’t work. So people bang on the wall if they want to get our attention. After traveling for hundreds of kilometres and seeing nothing but plains and scrub, we are now firm believers that the earth is flat. The people are lovely and quite accepting of us. The prisoners have free access from the gaol if they want to go out and do some community work and, to be honest, they seem quite nice too. 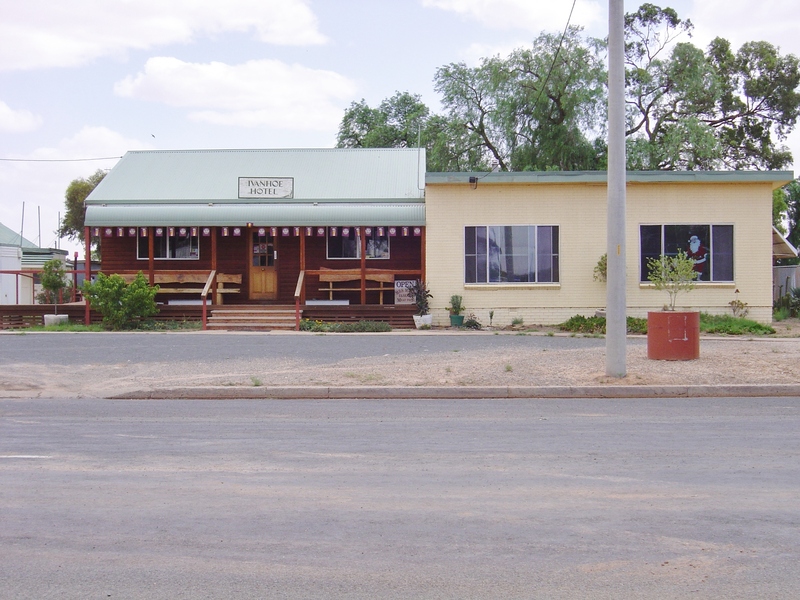 Warakirri Correctional Centre is one of only two minimum security gaols – the other one is at Brewarrina – where inmates can use knives and other utensils in the kitchen. The pub sold us 2 bottles of Champagne and then ran out (of bubbly) ….. which started the grand joke that the policeman’s wife had drunk the town dry! Last week we woke up to find a very large ram in the front yard . 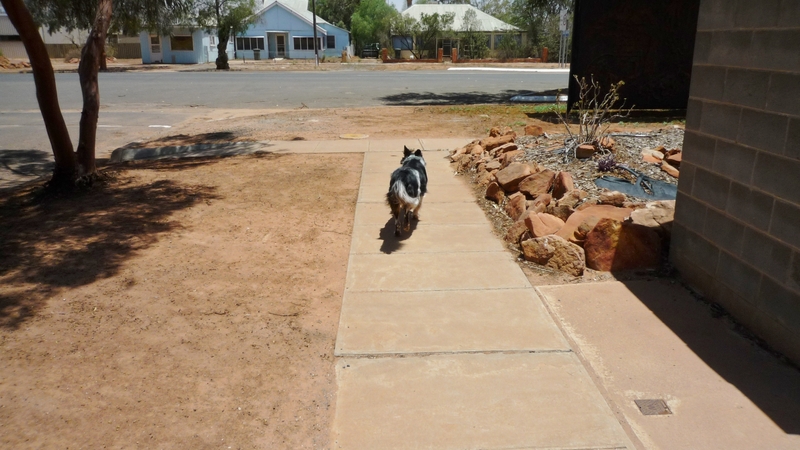 Bear thought it was great fun having something to chase but the ram decided otherwise and ran away to the RSL Club across the road (where it was later captured). We went shopping at Griffith and the round trip took 8 hours. Most of the roads are dirt roads (closed in wet weather) with lots of cattle grids to cross over. If you go for a drive to Broken Hill and it rains, your 3 1/2 hour drive will turn into an 8-hour return trip – via Dareton. We share the phone line with the other police residence and at the moment, we don’t really understand how the Commander system works. So if you ring us, you may get us or you may get the other cop. The yard consists of red dust and green weeds …………………..and treated sewage when the septic tank overflows in the afternoons. Apparently there’s been a work order to fix it since before we arrived ……………. things happen slowly in Ivanhoe. The town consists of about six streets by six streets to form a square. No one has a street number but some people use the last 3 digits of their phone number. Apparently Telstra came up with this idea a few years ago. Also, everyone gives their phone number as the last 3 digits (because the first seven digits are always the same). The police station sits on a corner block with the residences either side. It’s all quite incestuous because apart from sharing the phone line, we can access the station and the other residence without leaving the premises. The RSL and pub are literally around the corner as are the 2 service stations, the shop and the cafe. There are a lot more sheep than cattle but if you leave town, you’ll run into both. We’ve seen more emus than kangaroos but apparently the ‘roos are everywhere after dark…… for that reason, no one travels after dark unless they have to. So I guess there’s not much more to say. BTW, Bear says Hello and that he misses the beach but at least he has found a football oval to ‘work’ on. He also said to tell Jet that there are some nasty, nasty thorns around and, as no one here has their own letter box, there are no postmen in Ivanhoe.